Bolt Manager helps you quickly configure your wireless video system without a computer. 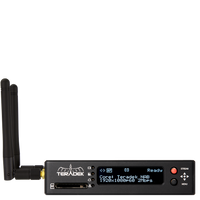 Perfect for rental houses, the Bolt Manager hardware box lets you rapidly pair multiple receivers*, change wireless channels, update firmware**, and configure regional settings during prep or on set. If you're looking for the Bolt Manager Software, you can find it in Downloads. *Bolt Manager's pairing feature is only compatible with Bolt 500, 1000, 3000, 10K, Sidekick II / XT / LT, and newer.